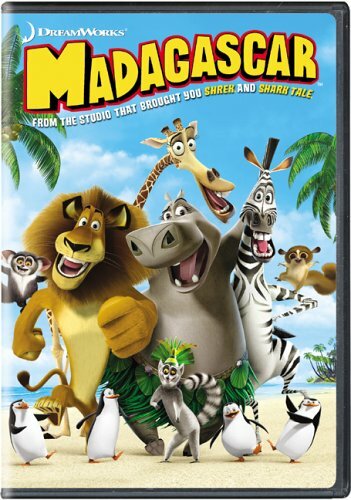 Madagascar had such high potential, but as is sadly so often the case, that potential is undermined by the use of potty humor and crudity. The story opens with four animal friends in a zoo – a zebra, a lion, a hippopotamus, and a giraffe. The premise is that Marty, the zebra (voiced by Chris Rock) wants to go to the ‘wild’. It’s his birthday, and he’s feeling old and like life is passing him by. Alex the lion (Ben Stiller) is his best friend. When Marty actually breaks out of the zoo, the other three go to find him. The potty humor starts early, with Melman the hypochondriac giraffe (David Schwimmer) giving Marty a birthday present of a thermometer. As Marty thanks him and puts it in his mouth, Melman tells him “You’re welcome, it was my first rectal thermometer.” Marty then spits it out, and yells “Mother-” (the “f*cker” is implied, but at least is not said). Melman the giraffe uses a public restroom and comes back and says “Look! Free mints” (displaying a toilet deoderizer cake on his tongue). The lion, hippo and giraffe find Marty the zebra at Grand Central Station. All the humans run screaming from the animals, except one old lady, who goes up to Alex the lion and proceeds to beat the stuffing out of him with her purse. The very next scene is of the 4 animal friends surrounded by a SWAT team, and about a hundred automatic weapons pointing at them. Then the old lady comes back, and kicks Alex right in between the legs. This is when one of the officers shoots Alex (it turns out to be a tranquilizer, which sends Alex on a psychedelic trip). When Alex awakes, the very act of his moving causes a volley of dozens of tranquilizer darts to be shot at him (although only one hits him, in the paw, sending him on another 60’s-style trip). The animals are all crated and put on a ship for somewhere. They end up falling off the ship, and marooned on an island. In the next scene a friendly spider is on Alex’s back and because Alex is afraid of spiders, the hippo tries to pulverize a spider with a stick. When they first meet the lemurs, the lemur king, who is insane, says “They are aliens, they are going to try to kill us,” but fortunately he has devised “a cunning test to see whether they are savage killers” – his test is to punt an adorable little baby lemur out into the open in front of the four animals – the baby is very scared and starts crying. When the animals don’t eat the baby, the lemur king accuses them of being “Just a bunch of pansies,” and uses the term ‘pansies’ several more times. When the four stranded animals from the zoo ask “Don’t you have any people here?” the lemur king responds “We have people of course, they are up there…” (pointing to skeleton hanging from a tree). “Don’t you have any live people?” queries Alex? “No, only dead ones,” the lemur king responds. In the meantime, the ship off which the animals fell is hijacked by commando penguins, who tie up and slap the human captain. Back on the island, the giraffe has dug himself a grave, and is sitting in it, because he is sure he is about to die. And many instances of “kill” “be killed” and “killer”. There is also one scene where the animals – who are desperate to get back to the zoo – finally start making peace with being in the wild. They are one with nature. They feel great, the music is upbeat, the zebra is bopping along in the jungle and finds an adorable little baby duckling. He very gently and sweetly picks the duckling up and brings it to the water, and places it at the water’s edge, where it makes cute little duckling noises and swims out along the water..and..a giant killer whale jumps up out of the water and eats it. In short, this movie was a complete disappointment, and I wish that our 9 year old had never been exposed to it.